As part of the ZC50 Aug 11-13 weekend events, there was a ceremony to inaugurate the Peace Bell at City Center. Abbess Kiku Christina Lehnherr officiated. 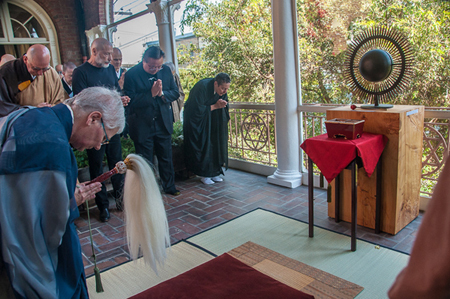 From left, Abbot Myogen Steve St�cky, Al Farrow, Shinji Eshima, and Tova Green. Tova interviewed artist Al Farrow for a Sangha News article in May 2012. See a slideshow of the Monday, August 13 events including more photos by Susana Millman, as well as photos by Shundo David Haye and Kate Sommers-Dawes.